42mm stainless steel case, transparent sapphire glass back, silver sunray dial, automatic El Primero 4021 movement with hours and minutes, small second, power reserve, chronograph, approximately 50 hours of power reserve, black alligator leather strap with deluxe deployant buckle. Water resistant to 10 ATM. 42mm stainless steel case, transparent sapphire glass back, black sunray dial, automatic El Primero 4021 movement with hours and minutes, small second, power reserve, chronograph, approximately 50 hours of power reserve, black alligator leather strap with steel pin buckle. Water resistant to 10 ATM. 42mm stainless steel case, transparent sapphire glass back, black sunray dial, automatic El Primero 4021 movement with hours and minutes, small second, power reserve, chronograph, approximately 50 hours of power reserve, stainless steel bracelet. Water resistant to 10 ATM. 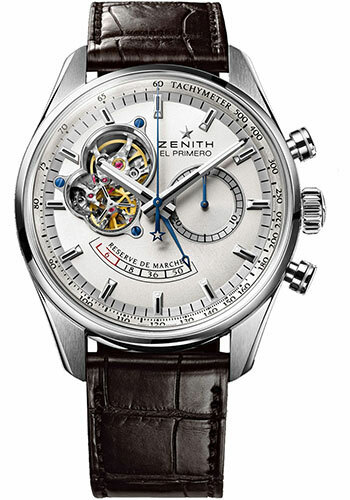 42mm stainless steel case, transparent sapphire glass back, white mother of pearl dial with diamond hour markers, automatic El Primero 4021 movement with hours and minutes, small second, power reserve, chronograph, approximately 50 hours of power reserve, black alligator leather strap with steel pin buckle. Water resistant to 10 ATM. 42mm steel case, 14.05mm thick, transparent sapphire glass back with oscillating weight, côtes de genève pattern, steel bezel, domed sapphire glass crystal with anti-reflection treatment on both sides, blue sunray dial with hour markers and hands faceted, rhodium-plated and coated with superluminova sln c1, el primero 4021 automatic movement with hours and minutes in the center, small seconds at 9 o'clock, power-reserve indicator at 6 o'clock, 2-counter chronograph: central chronograph hand, 30-minute counter at 3 o'clock, tachometric scale, approximately 50 hours of power reserve, blue alligator leather strap with protective rubber lining, triple folding clasp buckle. Water resistant to 10 atm.